1. Soak green peas in water for 5-7 hours. In a vessel, add enough quantity of water and little salt, and then boil the peas until the peas turns soft and firm. It may take about 8-10 minutes. Drain the peas and keep aside. In a pan, heat a teaspoon of oil and then add mustard seeds. When mustard seeds splutter, add urad dal, red chillies, asafoetida, and curry leaves. 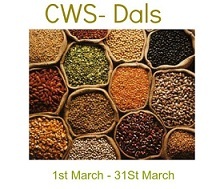 When urad dal turns golden brown, add the chopped onion and fry till they become transparent. 2. Then add boiled peas and saute for few seconds. Check salt. If needed, add more salt as per your taste. Peel the skin of mango and grate it. Now add the grated coconut and grated mango to the peas and mix well. Switch off the flame. Just before serving, you could also add a teaspoon of lemon juice to get some tangy taste. Now, Green Peas Sundal is ready! You could also pressure cook the peas for 2 whistles by adding less water and salt. You should be careful while pressure cooking the peas, as sometimes it may turn mushy. Allow the cooker to cool naturally and then drain the peas. If you are using frozen peas, you do not have to soak or pressure cook the peas. Just cook in an open pan with very less water. You could also add grated carrot and finely chopped ginger. 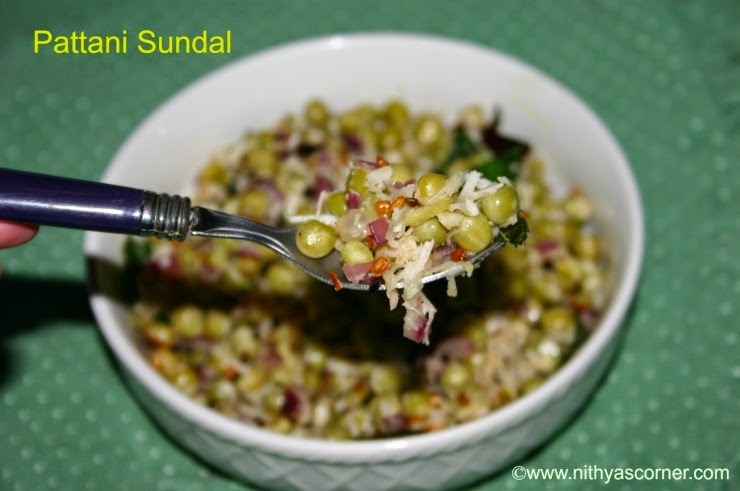 This entry was posted in Navratri Recipes and tagged grated coconut, green peas, Green Peas Sundal, Mustard seeds, Peas Sundal on November 22, 2014 by vikashbhardwaz. 1. In a cooker, put 3 tablespoons Ghee, cashews(whole), pistachios, Almonds (Badam), raisins, and basmathi rice. Fry basmathi rice for 2-3 minutes. Now, add milk and 2 to 2.5 cups of water. If you do not like to taste the whole cooked rice while eating payasam, then before adding rice to the cooker, you could dry grind the rice in the blender just for a second or two then add it to the cooker. You just have to break the rice. Do not grind the rice to a fine powder. If you wish, you could add cardamom at this stage. If you are using saffron, avoid cardamom. Basmathi rice gives a nice flavor. You can also use raw rice. 2. Also, add condensed milk and half cup of sugar. Close the cooker, put weight, and cook for 3 whistles. You can add sugar according to your taste. 3. Wait till the pressure comes down and then add water (depending on the thickness you want), sugar, and Ghee. You can also add saffron strands at this stage. Keep it in low flame and boil for 5 more minutes. You can also mash up the rice with a ladle. 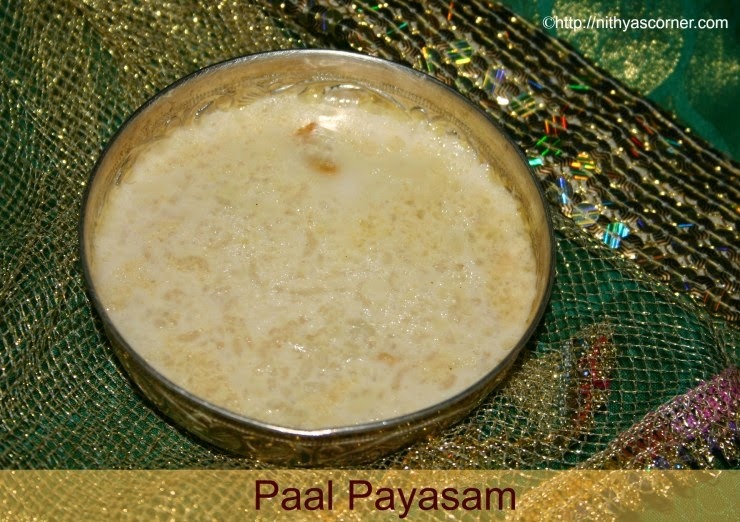 If you like to eat the whole grained rice along with the payasam, then leave it as such. The Kheer thickens with time so if you want it to be in loose consistency, add more warm milk to it. You can also add a pinch of salt to enhance the sweetness. 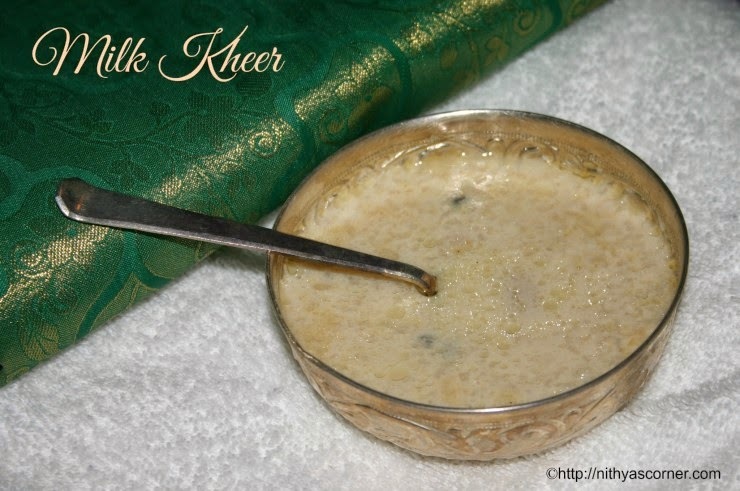 For Milk Kheer, milk should be more than the rice so use more milk and less rice. Now, Pal Payasam / Milk Kheer is ready!!! Serve. You can serve it chilled or warm. This entry was posted in Navratri Recipes and tagged Condensed Milk, Milk Kheer, Payasam on November 22, 2014 by vikashbhardwaz. 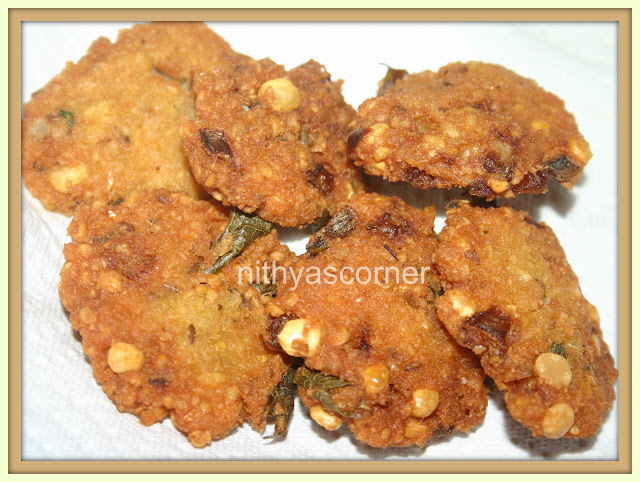 Masala Vada is a popular and a common snack in South India. It can be served as an accompaniment for sambar rice or even as a starter. Generally, we make it during festivals. Masala Vada has many variations, and this is one of them. Thanks Cookingandme for posting this yummy recipe. 1. Soak Channa Dal in water for 2 hours. Drain the water and grind the Channa Dal with rest of the ingredients. If you want, you can keep 2 teaspoons of Channa Dal aside and then add them to the mixture just before shaping them so that when you bite the Masala Vada, you can get a bite of the dal. 2. Meantime, heat oil in medium fire to deep fry the Masala Vadas. 3. If necessary, add just few drops of water. Do not add more water. Make lemon sized balls and then flatten it using your palms and then flip it in the oil. Deep fry it until the vada turns golden brown. Now, the Masala Vada is ready! 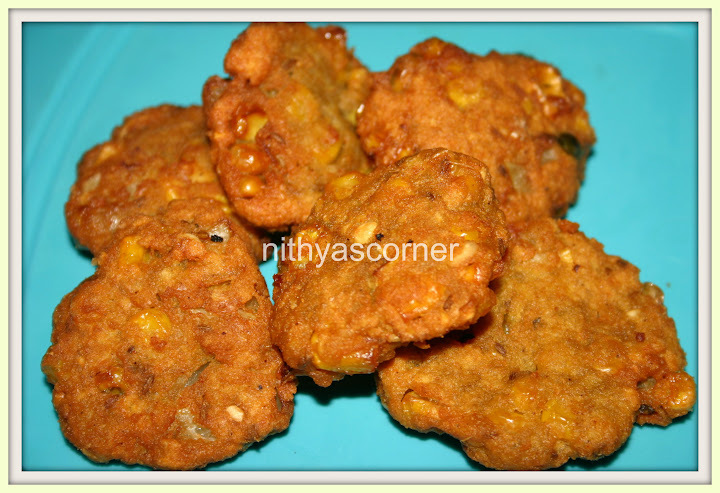 This entry was posted in Navratri Recipes and tagged Channa Dal, Garam masala powder, Masala Vada, Masala Vadai, Masala Vadas on November 22, 2014 by vikashbhardwaz. Dry Nuts Kozhukattai is one of my favorite kozhukattai. 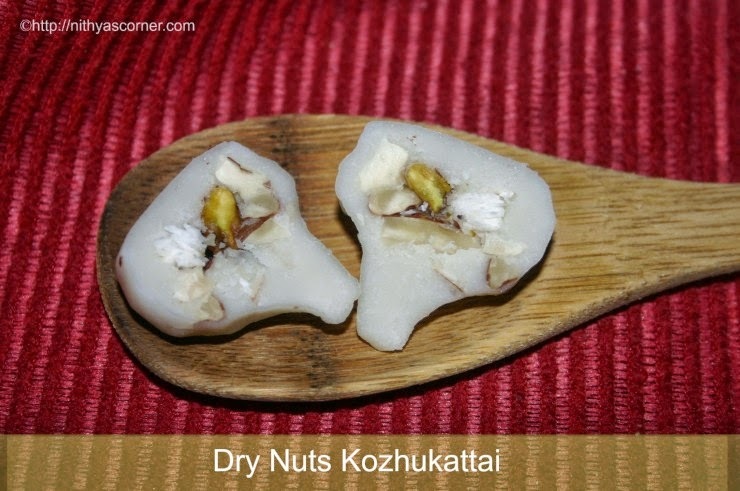 Till two years back, I didn’t know that you could make kozhukattai using dry nuts. For those who love kozhukattai and not the nuts, you could give them nuts this way. I have tried this recipe so many times but have never taken pictures. This time, I managed to take pictures. Yet when I was folding the kozhukattai, I found quite difficult to take pictures with one hand. Try it out for this Vinayaga Chathurthi and you’ll like it. Almonds (Badam) – 10 Nos. 1. Grind cashews, Almonds (Badam), and pisthachios coarsely and keep it aside in a bowl. To this, add grated coconut and powdered sugar. If you would like to use peeled almonds, you may want to refer “How to Peel Almonds?” In a mixing bowl, add rice flour and salt. Mix well. 2. Now slowly add water to form a soft dough. 3. Make medium sized balls and using your fingers, shape it like an umbrella. Put the ground dry nuts mixture inside. 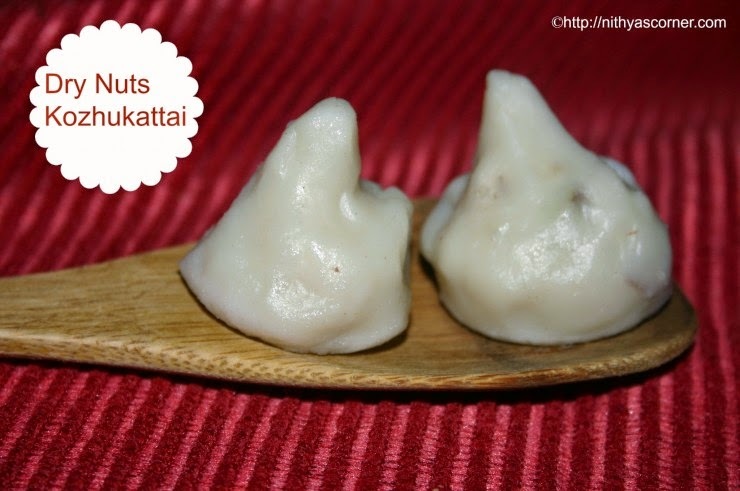 You can shape the kozhukattai as you wish. 4. Now, close the balls. Do the same for the remaining dough and keep them aside. 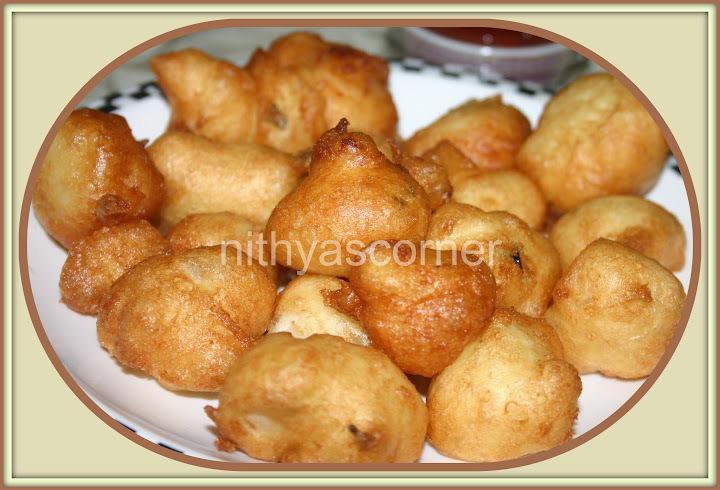 In an idly pan, apply oil and keep the balls or shaped kozhukattai in it. 5. Steam for 10 minutes like how you do for idly. Open the cooker after 5 minutes. Sprinkle Ghee and the remaining dry nuts mixture on top of the kozhukattai before serving. Now, Dry Nuts Kozhukattai is ready! .You can use any nuts you want. Shelf Life is two days. 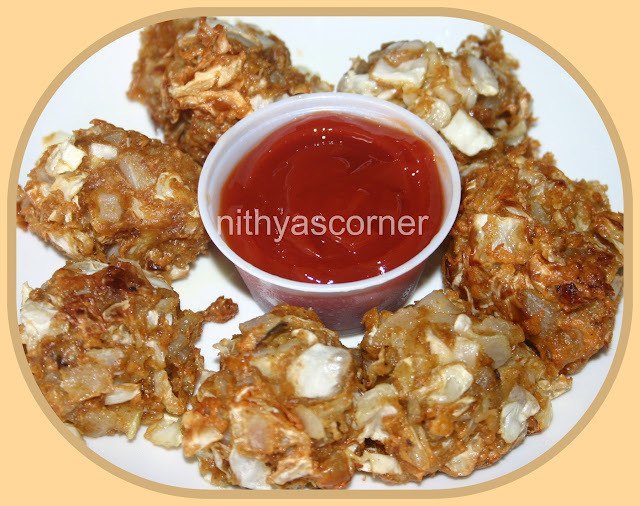 This entry was posted in Navratri Recipes and tagged Banumathy Ramesh Recipe Category, dry nuts, Dry Nuts Kozhukattai, kozhukattai on November 22, 2014 by vikashbhardwaz. This entry was posted in Navratri Recipes and tagged Channa Dal, Corn, cumin seeds, Curry Leaves, Turmeric Powder on November 22, 2014 by vikashbhardwaz. This entry was posted in Navratri Recipes and tagged Chilly Powder, coriander leaves, Finely Chopped Onion, Grated Carrot, Koftha Ingredients, shredded cabbage on November 22, 2014 by vikashbhardwaz. This entry was posted in Navratri Recipes and tagged Curry Leaves, Pinch Asafoetida, Pinch Salt Oil on November 22, 2014 by vikashbhardwaz.